Meet the artisans, discover their expertise, and share their passion. A detailed look at beloved brands, inspiring stories, and important events. With our eco-friendly I.FIV5 collection called “Creating An Echo,” we hope to shine a light on the environmental issues that we at Simons care so deeply about. We've had the opportunity to partner with CPAWS—an inspiring Canadian charitable organization—to celebrate Earth Month 2019. 365 days a year, CPAWS devotes its time, energy, and resources towards protecting our nation’s wilderness and the valuable ecosystems that stretch from one coast of Canada to the other. We believe there is an important lesson to be learned from the organization’s conservation efforts and their fight to keep Canada’s public land and water wild. In hopes that a harmonious and respectful relationship might be attained between humans and the environment we live in, we’d like to take this opportunity to list a few of the extraordinary Canadian locations that exist in our very own backyard. It's nature in all its splendour mere minutes away from a bustling metropolis, talk about the best of both worlds! Whether going for a walk, bike ride, or canoe trip, Îles-de-Boucherville National Park is a paradise for athletes all year long. The 5 small islands that make up the park are beloved by the residents of Montreal and the surrounding region who, from its scenic views of the St. Lawrence River to its lush forests, can attest to the richness and scope of the park's plant life and wildlife. Coursing through the heart of one of North America’s largest expanses of wilderness (second only to Alaska) is the Magpie River, one of Quebec’s last untamed rivers that stretches for 280 kilometres. Internationally recognized as one of the top white-water destinations in the world, the river is a favourite among recreational tourists and thrill seekers. In a campaign to protect the waterway from the ongoing risk of hydroelectric development, CPAWS Quebec commissioned a study that emphasized the white-water potential of the Magpie, comparing it to other famous waterways like the Colorado River, a favourite among kayakers. Each season seems to bring out the best of this 361-square-kilometre patch of land that makes up Gatineau Park. Located in the St. Lawrence Lowlands, this prime destination for outdoor activities is an absolute must-see for anyone living in or visiting the National Capital Region. Hiking, camping, and a long list of water sports are just a few of the things one can do here. Despite it being one of the few places in Canada with such rich biodiversity, it is not yet recognized as a national or provincial park, leaving it vulnerable to certain risks and threats. An important hallmark in Canada's heritage, this historic watershed runs a winding path through heavily forested areas of rich and luscious pine. From Lake Nipissing all the way to the Georgian Bay, the French River flows through a long series of small lakes, waterfalls, and rapids. It’s the perfect spot for a scenic picnic on one of its banks of exposed glaciated rock, a long and leisurely canoe trip, or a day spent cliff jumping for more daring folks. What’s more, the river is one of Ontario’s last sources of clean drinking water and is home to a great number of animals native to boreal forests, and for that, it is incredibly precious. South of Calgary and east of the Canadian Rockies exists a sweeping area full of pristine lakes, white-water rivers, wide prairies, and stunning views that’ll take your breath away. Kananaskis, Whaleback, Castle: every one of these pockets of mountainy wilderness are essential pieces of the ecological puzzle that is Alberta. These exceptional areas need protection from inappropriate recreation use and increasing industrial pressures. In the backwoods of the great Canadian wilderness lumbers the large and regal silhouette of one of Canada’s national emblems: the woodland caribou. This majestic member of the cervid family tree is an umbrella species, which means that its presence supports the survival of a great many other species. 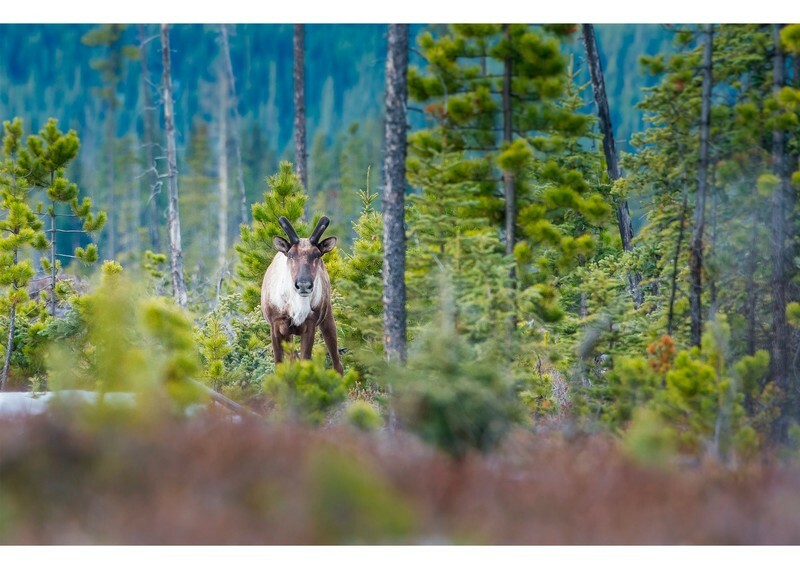 Only fifteen herds remain in Alberta’s boreal forests and mountains that cover close to a quarter of the province’s surface area. Unfortunately, this animal’s population is drastically declining due to climate change and human activity (forest fires, poaching, sound and sensory pollution, oil drilling, and road development). However, this is a situation that's not too late to fix! Alpine meadows, old-growth forests, sweeping grasslands, and the Pacific Ocean: welcome to beautiful British Columbia, the most biologically diverse province in Canada. The many protected parks, trails, and ecosystems that make up this stunning landscape are home to some of the planet's most spectacular natural wonders. Boasting over 20 million tourists a year, it has proven its worth as a recreational attraction time and time again. This has made it incredibly susceptible to human pressures, which threaten many of its native species. 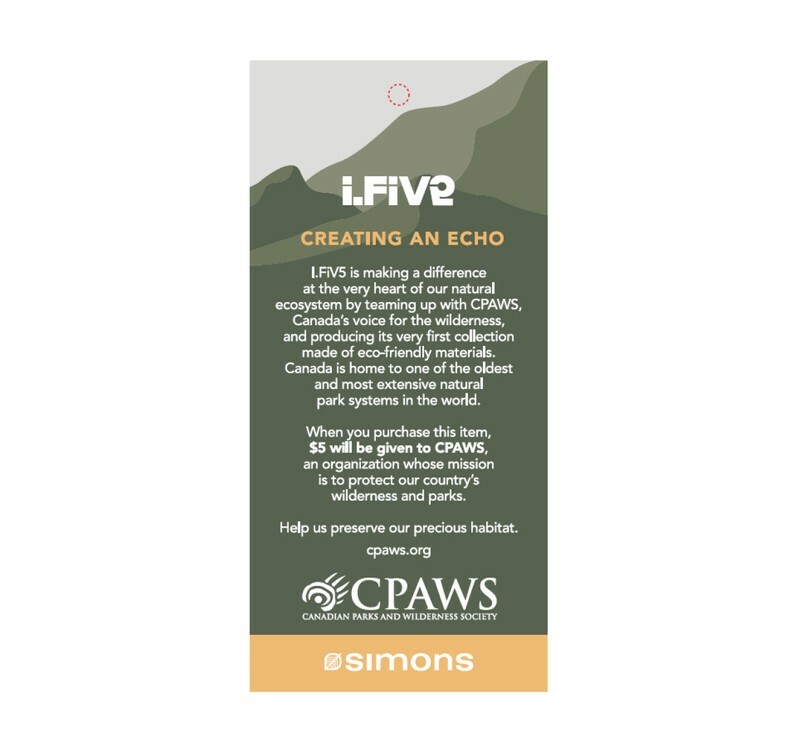 When you purchase a garment from our Creating An Echo capsule collection, $5 will be donated to CPAWS to help them protect and preserve these incredible locations that surround us. It’s a smart way to contribute to the protection of the great and beautiful Canadian wild while satisfying sports lovers at the same time. Look for our exclusive tag in store! To celebrate our Creating an Echo collection, influencer and globe-trotter Catherine Simard became our i.FIV5 photography ambassadress for the second time in a row. Whether you're in high school, college, or university, prom is a sign of accomplishment and a night to celebrate. But it's also the perfect occasion to wear an evening dress that's formal-function-worthy. The invitation has arrived! You're getting ready to attend a celebration of love that promises to be unforgettable. But what will you wear? Klein felt canvases, sculptures, and even sponges covered in monochrome colours worked best to awaken our awareness of the infinite because, similar to being in a meditative trance, they could transport the viewer out of the present moment and into a metaphysical realm. According to Klein, monochromes liberated anything from its physical form and allowed the viewer to experience immateriality. Whether they're long, flared, or fitted, dresses have evolved over the years while maintaining their place on the top shelf of women's wardrobes. Follow our guide and discover the main types of dresses, as well as our tips on how to wear them. At Simons, we experience the magic that happens when women work together and support each other, since our company is primarily made up of women. Today, more than ever, we are proud to promote women leaders. Twice a year, our team in charge of artistic direction at Simons Maison sets out to select a house to act as a backdrop in our seasonal decor catalogue. A Canadian family-owned business just like Simons, Canada Goose is proud to have maintained its manufacturing within the country thanks to its seven facilities across Canada, including one in Boisbriand in the Montreal area. Assembling our window displays for the holidays is an early sign that the season for making merry is just around the corner. Are you familiar with the expression “eating with your eyes?” Whether it's a hearty meal or a more formal fête, taking your seat around a table that's beautifully set and divinely decorated can definitely influence your dining experience. This fall, Simons is extremely proud to be teaming up with the Breast Cancer Foundation. The Foundation's spokesperson, Mitsou Gélinas, and four of its ambassadresses agreed to model for one of our photo shoots and to share with us what it is that gives them strength, courage, and hope. Volcom recently made the journey over to London to meet their muse, international model Georgia May Jagger, and propose the idea of working together on their latest project: a brand new collection. Dazzling and down-to-earth is how we would describe Canadian model Tiffany Meia. Featured in our latest Twik photo shoot, she's not only garnered tons of followers on Instagram, but also contracts with world-famous brands like Levi's, The North Face, Tiffany & Co., and Nike. We recently sat down with her to discuss her career, family, and goals. MARATHON SEASON: What to wear on your runs? 5 or 10, 21.1 or 42.2 km, whatever your goal for running might be, it's essential to be well prepared and well dressed. The Summer Party That'll Be a Smash Hit! The yard to stage left, the garden to stage right… Outside is where the season's most critically acclaimed celebration will be taking place. On with the show! The final phase of the nationwide 3DCanada project is finally being revealed! Admire the finished piece at the Ottawa Art Gallery from June 19 to August 19, 2018. The legendary Calgary hatmaker keeps a time-honoured tradition alive and current. One of the things we love about fashion is the way it can instantly alter your mood. Thousands of people will be there. Listed on the line-up are dazzling performances, lots of music and fun, new friends, and that feeling of being part of an utterly unforgettable experience. Beauty equals power – especially when it's a subtle approach to sustainable consumption like Winnipeg native Bronwyn Seier's beautiful and ethereal collection. Season after season, Lemaire delivers unpretentious and pared-down collections, where luxury is found in the rich materials used and the structured, elegant cuts. When it comes to caring about the environment, we've got a lot in common with Simon Nessman, the face of our Spring/Summer 18 Men's Designer Campaign. Creative, avant-garde, adventurous, meticulous, and unique: Marni's sophisticated and surprising style has been charming fashion fans since the brand's very beginning. It's hard not to get star struck sitting down with someone like Nova Orchid. Shining just as bright as her celestial namesake, this Montreal model shot to sartorial stardom by rocking the runway for some of fashion's foremost luminaries, like Chanel and Sonia Rykiel. It's not every day that two major models step into our studio, and even more rare that both call Canada home! We were excited to sit down with Elizabeth Davison and Steph Smith in order to learn a little bit more about these lovely ladies. As the magic of the holidays envelops us – in every city and town across the country, there are Canadians gifting something very special to our communities. If Canadian winters are long and harsh, they're also impressive, unique, and host to a number of magnificently rich moments. This is what inspires the proud Canadian coat brand, Quartz Co. It's beginning to look a lot like Christmas... This seasonal song is certainly ringing true at Simons as we recently installed our stunning window displays for the holidays. What's waiting for you as you pass in front of the glass? Snowy scenes presented in pale pinks and gorgeous light greens! Sharp Magazine recently met with a few faces from our men's buying team at Simons. Discover a bit about these trend hunters who travel to cities around the world, looking for the best of the best in menswear. Saute-Mouton is the brainchild of a family of passionate, skilled artisans. It's 33 people who work tirelessly to make sleek and comfortable boots to face the biting cold of Canadian winters. And it is a company that is fundamentally proud to be Canadian. When Emily Molnar took over as artistic director of Ballet BC, the Vancouver-based dance company was on the brink of bankruptcy – another cultural institution that had yet to find its footing in this new, fast-moving digital world. For the fall/winter 2017-2018 season, Simons produces its very first NV unisex collection. Close your eyes and imagine yourself on the magnificent St. Lawrence River or the majestic Pacific Ocean that runs along Canada's West Coast. Vitaly is proof of the power of simplicity. This Toronto-based lifestyle brand creates high-quality clothing and accessories with an urban look and rebellious attitude. Its goal is to elevate the everyday with carefully placed details, while letting clean, structural lines do all the talking. Scrolling through a myriad of gorgeous, inspiring home decors on Instagram or Pinterest, we often find ourselves dreaming of transforming our own home with the latest trends. One, tiny problem? The budget. True symbols of adventure, bags are our best companions on any journey, whether big or small. It's not surprising then that Jamie and Lyndon Cormack, two brothers passionate about travelling, chose them as their main product when they founded Herschel in 2009. Weaving a new vision: Xiaoyi Li, CAFA Simons Fashion Design Student Award, is the future of fashion for a conscious generation. Their story is of an unconditional love for fashion, a tale that started in Quebec City in 1840 and that has continued ever since. Teams of glossy thoroughbreds pulling wagons at breathtaking speeds, dodging barrels as outriders gallop alongside in a complex waltz – It's a thrilling experience. The fascinating choreography of chuckwagon racing, which debuted as a sport during the 1932 Calgary Stampede, draws a huge crowd that often includes celebrity spectators such as Prince William and Kate, the Duke and Duchess of Cambridge. It's always June somewhere… There's always somewhere in the world with good weather, bright sunshine, and warm, welcoming water. This mantra is an invitation to escape and a driving force behind June Swimwear. The brand's mission is to give women the desire to travel and surf, as well as the freedom to dream! Molly Spittal's studio looks like it belongs to a sculptor: raw materials waiting to take shape, special tools for producing precise work, and large windows that cast light on even the tiniest detail. With her hands, she can make the perfect bag, an understated and functional piece that will last for years. The CAFA gala, an event run by some of the biggest names in fashion, recognizes outstanding achievement and emerging talent in the Canadian fashion industry. Spring Blooms on LIBERTY FABRICS! Discover Liberty London, the prestigious print house that's reinvented its unique floral art every season since 1875. Simons presents its own exclusive collections that feature the oh-so-British label in Contemporaine for women, in Le 31 for men, and in its Simons Maison department for the home. Making products that make people happy! Step into an imaginative world where unique decor accessories transform spaces into great places to live. A Sunday afternoon spent by the water in a swimsuit and shades... Hard not to smile imagining this scenario! This feeling is what drives the creators behind the brand Everyday Sunday daily. "Relax and enjoy" is their motto! 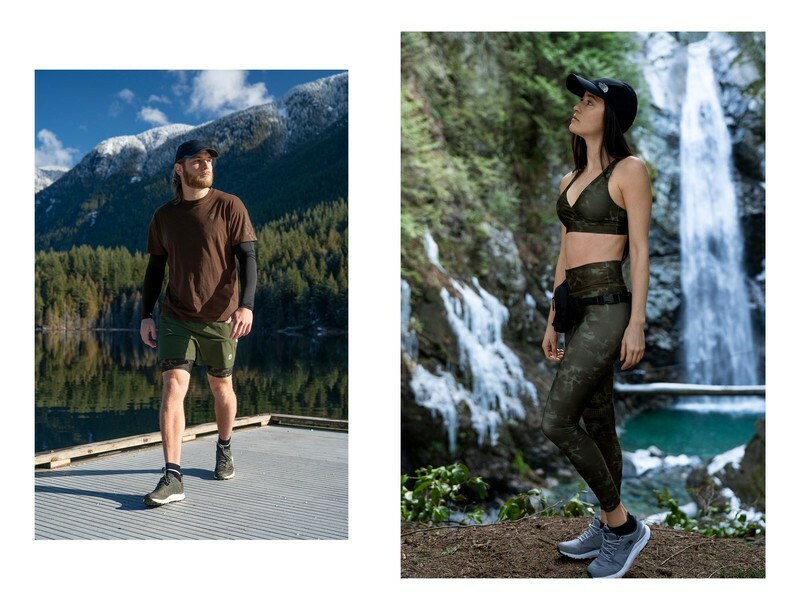 Knowledge Cotton Apparel: An eco-friendly collection! A Scandinavian menswear company with highly responsible environmental practices. Let's celebrate our ability to help one another! to promote International Women's Day, Simons would like to show our support for three organizations that work to help women in need of a hand getting ahead and getting out of difficult situations. Adrianne Ho, originally from Toronto, and Franky Cammarata, a Los Angeles native, are two international models that have numerous magazine covers and prestigious collaborations to their credit. Spotlighting an experienced and well-recognized family business that designs superior quality women's shoes that are as chic and on-trend as they come. Hopehanger, T-shirts made of 100% pure hope! An exclusive new line of clothing created by two parents looking to help contribute to autism research. This British company is making its grand entrance into the home fashion scene, offering an array of luxury duvet covers and cushions. 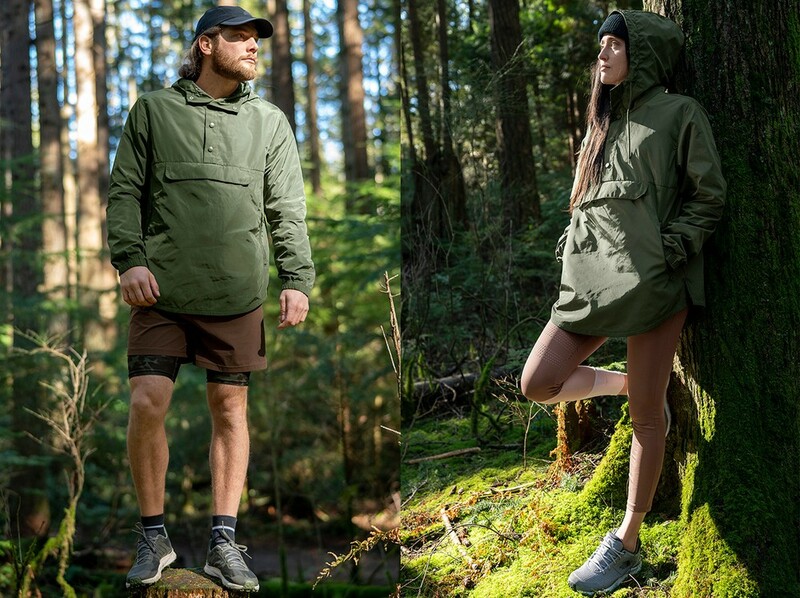 Discover the outdoor clothing brands that are taking action to promote sustainable development. The Swedish brand makes tights and nylon stockings from recycled threads. Our team spent a few days on Fogo Island for a photo shoot in a magical setting. This is it! We're now located in our nation's capital. Today, Thursday, August 11, Simons' expansion across Canada continues with the opening of our thirteenth store in Ottawa! Go sporty or retro for a chic back-to-school look! Actress Vanessa Pilon, the bubbly young host of VRAK.TV, can count us here at Simons among her biggest fans. Whether you like it or not, back-to-school is just around the corner. This year, we've decided to come back with a bang! No corners have been cut and we've got everything from Instagram collaborators to thematic galleries and prizes to win. There is no better way to enjoy summer than by being out in the fresh air! The Orchestre symphonique de Québec (OSQ) is performing Beethoven's Ninth Symphony: a seminal work in the history of music! With summer just around the corner, the bluebellgray collection could not be making a better-timed debut. The brand's signature watercolour graphics will take you to a summery world of colour and artistry. Montreal-based painter Melissa Del Pinto has welcomed us into her studio to show us a world where birds are larger than life.